It's not uncommon for people to rotate their art collections. We collectors tend to own more than we can ever display but there is also a need to rearrange and experiment with new vignettes. We have been working on relocating some of the garden sculptures recently. I have shared many of them with you in the past including my chrome balls and the grasping fingers. 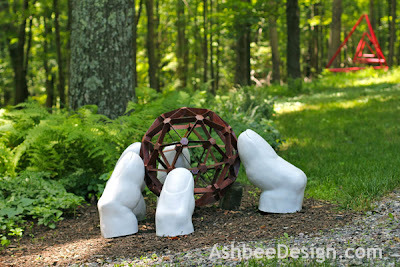 David recently did a little rearranging which include combining the fingers with the Restoration Hardware sphere I acquired last summer. It is a very effective combination. 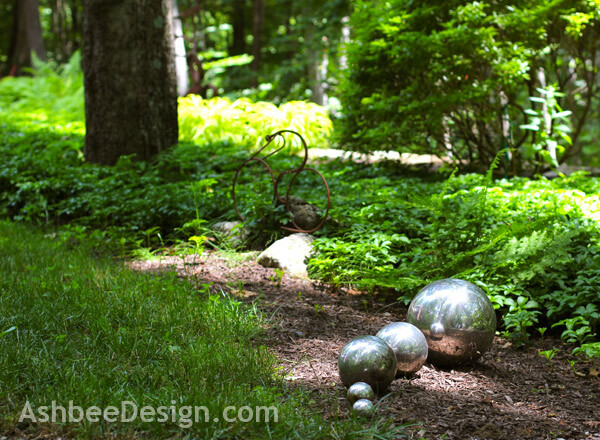 He moved the chrome balls to another corner and aligned them in a new arrangement. Both are an improvement over the previous display.